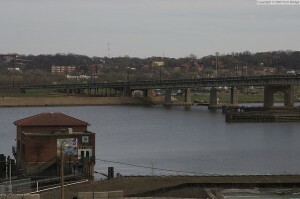 A view of Anacostia from west of the river. On Monday, we wrote about how a nonprofit’s plans to open a transitional housing building in downtown Anacostia for homeless women has sparked protests by neighbors. Some feel Anacostia is becoming a “dumping ground” for social services, and this is hurting the neighborhood’s chances for economic development. Calvary is planning to relocate from Chinatown to Anacostia. It’s true that more job opportunities exist west of the Anacostia River than east of it. Traveling across the river can be timely or expensive; one alternative is the DC Circulator, which recently started running a rapid $1 bus line connecting Anacostia to the Potomac Avenue Metro across the river. Those dollars are obviously going to be able to do more in Anacostia than in Chinatown, which is home to some of the highest retail and commericial rents in the city. Calvary rents space in Chinatown and purchased a vacant Anacostia building for $950,000 with plans for a $3 million renovation. It could be argued that there are more residents in need living in Ward 8 than in Chinatown who could benefit from Calvary’s move; 36 percent of Ward 8 residents live below the poverty line, according to census estimates. Some of D.C.’s homeless shelters are moving in part because of the changing demographics of their neighborhoods. Take Central Union Mission, which is leaving its Logan Circle building for downtown. Executive Director David O. Treadwell told Borderstan that gentrification was a major reason behind the move: “We could see the writing on the wall, and we felt like eventually this would no longer be a poor neighborhood. We weren’t priced out since we own our building, but we wanted to be where the people who need our services were.” If similar economic revitalization happens in downtown Anacostia, will Calvary eventually see a reason to move as well?